Mayor Lois Jackson presented awards of recognition to Tsawwassen Boundary Bay Lions Club members Walter Melnyk, Roger Lasell and David Morisawa on Monday. The Tsawwassen Boundary Bay Lions Club and several of its members were recognized at city hall Monday for years of service to the community. Mayor Lois Jackson paid tribute to the club’s 50-year history and recognized three members for their long-standing service. The mayor presented certificates to Walter Melnyk for his 62 years of service, Roger Lasell for his 35 years of service and David Morisawa for his 52 years of service. “Back in March of 1968, a couple of fellows got together with Ladner Lions Club members and discussed the idea of forming a new Lions Club for Tsawwassen,” said Jackson. 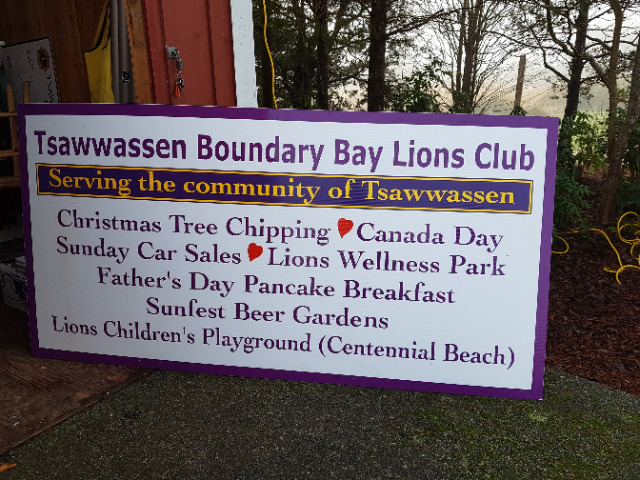 “Out of that meeting the club was formed and a charter was signed in June 1968, sponsored by the Ladner Lions to serve the communities of Tsawwassen, Boundary Bay and Point Roberts. “Over the years the club has supported the community admirably through programs for community groups, children and seniors, projects benefiting the community, an annual bursary for students as well as donating to the hospital and Reach,” Jackson said. The club raises funds in a number of ways, including pancake breakfasts, Tsawwassen Sun Festival, Christmas events and many more. The club also has a huge role in the annual Canada Day celebrations in Tsawwassen.